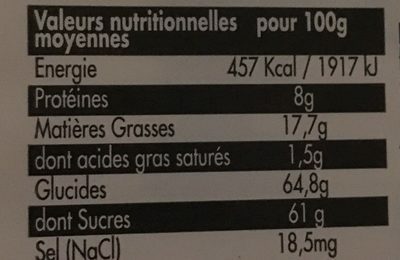 Sucre, sirop de glucose, fruits secs (amandes, noisettes), miel, blanc d'œuf, pain azyme, (fécule de pomme de terre, eau, huile de tournesol), vanilline. Product added on May 7, 2014 at 1:38:28 PM CEST by openfoodfacts-contributors. Last edit of product page on February 22, 2019 at 3:39:04 PM CET by kiliweb.